I read Bill Willingham's Shadowpact wanting it to be his Fables, and unfortunately, it's not Fables. Even as I enjoy Shadowpact, at times it's hard for me to believe this is the same writer as Fables, just as it was hard for me to believe during Willingham's run on Robin. Ultimately, however, I thought Shadowpact: Cursed was a story superior to Shadowpact: The Pentacle Plot, and the end did leave me eager for the next volume. One jarring thing about Bill Willingham's Robin stories were the short, jarring scenes, and this gets even worse in the second chapter of Shadowpact. Sometimes Willingham would jump back and forth between different scenes in Robin with only a page's difference, and rather than packing more story into each chapter, it just made the whole thing feel unfocused. In Shadowpact: Cursed, this is raised to a level of inanity--each scene begins with a narration box that reads, for example, "In Gotham City," but then when it switches the next box reads "Back in Gotham City ... again," and "Still in Gotham City." The writer, it seems, recognizes the choppiness and embraces it, when he might as well just cut it out. Rather than making Shadowpact seem boyant, which I think is the goal, it translates to a poor reading experience. On the other hand, it wasn't until I re-read Shadowpact: The Penacle Plot that I got how Willingham starts each chapter with a bit of introduction from the Phantom Stranger. Like EC Comics of old, this gives each chapter of Shadowpact a Tales from the Crypt introduction, and I enjoyed it very much; it also helped, in Pentacle Plot, to lessen the need for chapter breaks and help the book to read like a graphic novel. Unfortunately, Shadowpact: Cursed has the issue covers breaking the chapters; I never quite thought before about the impact of covers within the trade, but now I'm sure I'm against it. I'd rather see a cover gallery at the end, and pretend I'm reading one big story in the trade. In terms of story, Shadowpact: Cursed begins with the Shadowpact united in a fight against the Demon Etrigan, but most of the story follows just Blue Devil, Nightshade, and a couple of mostly-new magical heroes battling to retrieve Blue Devil's trident from Hell. 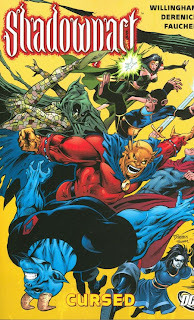 My inclination would be to prefer to see the Shadowpact together rather than these new heroes, but Willingham does a good job introducing them and making me want to learn more about the DC Universe's other magical denizens. As well, although the Enchantress doesn't take a front-seat role in this story, her efforts to keep alive an injured Nightmaster were surprisingly touching. Just as Ragman got his own issue in The Pentacle Plot, both Nightmaster and Blue Devil get special focus here. Blue Devil is an old favorite of mine, though nothing really new is revealed about him; Nightmaster learns, however, about the legacy and increased powers of his sword. With Ragman, Willingham showed how his seemingly evil powers were really a blessing; similarly with Nightmaster, Willingham shows how the hard-luck hero is actually part of a majestic legacy. One of the tenets of the Shadowpact group is that they're second-hand heroes doomed to fail, but Willingham continues to show in these profiles how the heroes are stronger than even they themselves may think. Shadowpact also appears to be unlikely ground for Willingham to examine what it's like to be a hero in the DC Universe. Increasingly the Shadowpact has been faced with media coverage, even when reporters can't quite get their names right, and Metropolis even built a memorial to the Shadowpact when they supposedly died. In Cursed, the Shadowpact reveals their three rules of superheroing--which involve saving bystanders first, themselves second, and the villains third--and some controversy brews about these rules among the rest of the super-hero community. I know the Justice League appears in the next Shadowpact volume, and I'm eager to see if this comes up; by tying Shadowpact to a "real world" issue like media scrutiny, Willingham makes this "magic" title far more accessible than some of its predecessors. If I'm hard on Shadowpact, it's only because I've become accustomed to greatness from Bill Willingham. Shadowpact: Cursed ends with a light cliffhanger note, and while I felt this story had its flaws, the end made me eager for the next volume. I've also seen, unfortunately, that Shadowpact is cancelled with issue #25, though hopefully DC will collect the last issues in a final volume. I'll say again that Shadowpact has been in my opinion DC's most accessible magic title in a long time, and I'm sorry it won't be around for much longer. We'll stay on the magic train a little longer with Helmet of Fate, and on then maybe to some Legion. Thanks for reading!